This weekend we had some wonderful moderate temperatures, perfect for tidying up the garden before spring. My chives had been telling me that they needed a haircut real soon (the older leaves were all laying down while a few new young ones were standing up). Thus I embarked on what I thought was a little trimming up. Naturally, one thing led to another... and before I knew it I was finally tackling cutting back the rosemary. (This rosemary (unknown variety) had been a wee little thing when first planted almost three years ago. But it slowly started forcing itself into the gravel paths, sometimes taking root there.) Why did trimming the chives lead to whacking back the rosemary? Because once I cleaned up the chives, the bed looked lovely and pristine AND way too tempting for the squirrels to start digging in. So I needed mulch to keep the tree rats away and protect the soil from our occasional deluge-type downpours. The most common form of mulch around here is pine straw. 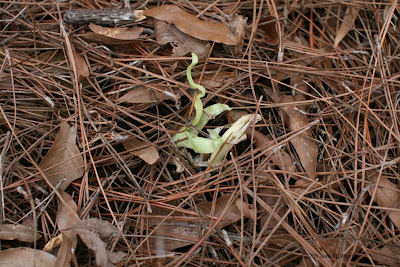 I encountered pine straw when I first started gardening in the little weed-strewn flower bed I inherited. 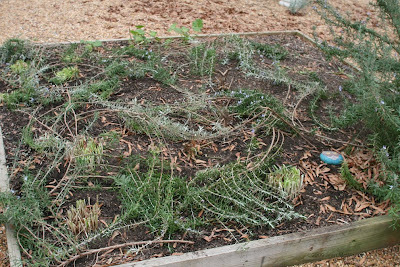 I really didn't like it that much because it was hard to pull the weeds without pulling up the pine straw with them. Of course I didn't realize that probably the previous owners had thrown it down so I wouldn't see the weeds while house shopping! But since that time I've come to appreciate it for staying put. I tried pine bark mulch but it just floated away during one of our typical storms. So now when I need mulch I usually turn to pine straw. It's a renewable resource if somewhat pricey. But I don't like pine straw in my square beds. I prefer to have an easy way to get at the dirt and I don't mind the occasional weeding. When the plants are beefed up in the summer, there's usually little room for weeds anyway. 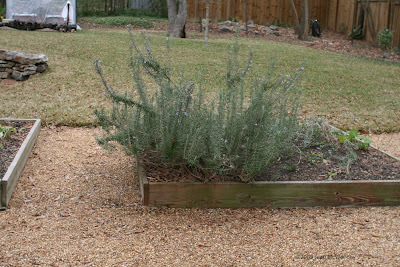 So in pondering my dilemma of a box of nice dirt just waiting for those pesky squirrels I remembered a post that Frances did about using rosemary clippings on beds to keep the squirrels out. Okay...so that means finally cutting the rosemary back. Update: you may wonder why I was dreading cutting back the rosemary. Part of the reason is that it's not as simple to do as with other perennials. Older rosemarys are very woody and if you think just cutting that wood at some point will generate new growth near the cut, you're wrong. So you have to sculpt as you go, making sure you don't leave any ugly cuts exposed. Hopefully any uglies I left will shortly be covered by new growth on stems above the cuts. Oh that rosemary will be fine. My girls love to trim and try to shape ours. Thanks for the tips on how to sculpt rosemary. Maybe that explains why I have murdered a few in the past. 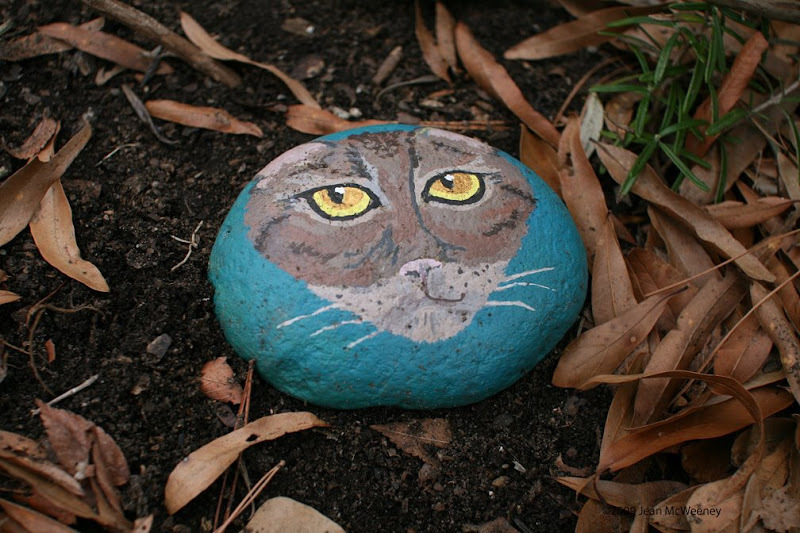 Now that cat rock is just "awesome" as the young folks say! Thanks once again for the "how to" on stretching my template. I am looking at your beds and plants enviously! I am raring to get out and start preparing for spring as I have loads to do, but the snow and ice just keeps coming! 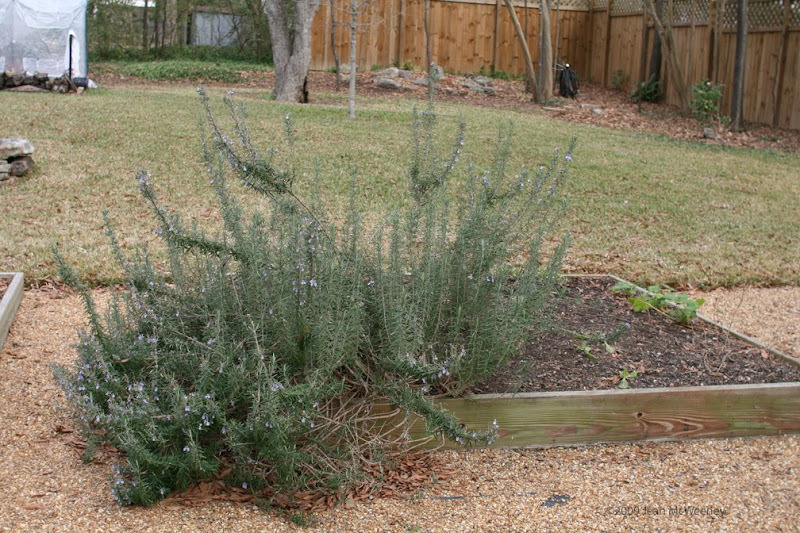 I have also noticed that rosemary responds strangely to cutting. I now cut pieces through the year rather than all at once. I use it fresh or dry it for use during the winter, and find that taking a bit (pruning as I go) regularly over several months keeps it looking pretty as you don't notice the cuts so much. I'm sure there are many things I'd like to do better this year! Thanks for your note - we have had more snow than usual this year, but we do get some most years. Being in the north of the UK no-one in London notices, but when THEY get snow.... everyone in the world knows! Still, it's just like we used to get 20 years ago, a proper winter! I don't mind, it kills a lot of slugs and snails which we have in plague proportions here. Fewer pests is a good thing. Thanks for the tip about the rosemary. I'll have to remember to use it to protect my seeds from the squirrels. I have trouble with neighbors cats digging up my seeds. Love the rock art. I need to paint some like that for my garden. Thanks for visiting my blog. I've been enjoying yours! You might try ground/shredded pine bark mulch. It doesn't tend to float as much as the pine bark nuggets do.